In recent days, signs of a possible breakthrough in the year-long stand-off between Russia and Saudi Arabia on crude production strategy have emerged. Saudi Arabia, OPEC's dominant member, has long insisted OPEC (read Saudi Arabia) would not reduce output to balance supply and demand absent corresponding cuts from non-OPEC members (read Russia), while Russia has consistently insisted harsh climactic conditions prevent Russian producers from reducing output and in any case Russia insists it could withstand low prices as well as any other country. "There's little sign the countries themselves are ready to reach an agreement despite the economic damage wrought by the lowest prices since 2003. Long-standing obstacles remain — Saudi Arabia's desire to defend market share, Russia's inability to cut production in winter months — and analysts say talk of a deal probably reflects the hope of producers in pain rather than the expectation of concrete action". Recent crude price action, however, has dashed such hopes and instead has raised the prospect of a deeper and longer recession. In a "stress" test it conducted in November, the Russian Central Bank estimated that with Ural crude prices below $40 per barrel between 2016-2018, the Russian economy would contract five percent in 2016, inflation would run at 7-to-9 percent, and that these conditions "would also raise risks to inflation and financial stability. The Russian government is also contemplating asset sales (including part of its stake in Rosneft and in VTB, a major bank), but such sales would provide one-time boosts to revenue and in any case would take time to organize. Borrowing is a possibility, since Russia's sovereign debt is low, but the Russian government can't access U.S. and European capital markets, closed to it due to U.S. and EU sanctions related to the conflict over Ukraine). Gazprom, Russia's natural gas giant, shows signs of stress. In recent weeks, it has instituted a series of cuts in investments. January 11, Reuters reported Gazprom cancelled one tender in December and three tenders in January for work on the construction of the Ukhta-Torzhok pipeline, a domestic key component of pipeline system which will transport natural gas directly to Germany through the Nord Stream II pipeline. According to Reuters, Gazprom Neft (of which Gazprom is the majority shareholder) recently terminated negotiations to acquire a 49 percent stake in Vietnam's Binh Son Refining and Petrochemical, a subsidiary of Vietnam's state-owned PetroVietnam. A January 15 Reuters article quoted "sources close to Gazrpom" as saying that Chinese economic problems and low energy prices have reduced the volume of natural gas Gazprom expects to export to China via the Power of Siberia pipeline—the project on which Gazprom has bet its future—when it is completed. Given the already questionable economics of the Power of Siberia project, reduced volumes will intensify doubts about the project's financial viability and future (Putin Is Taking A Big Risk With China Gas Deals). At the end of Q3, Rosneft's net debt stood at $24 billion. Yet, Alexey Bulgakov, a fixed income analyst at Sberbank CIB estimates that Rosneft may already have accessed the maximum amount of cash it can under the deal, given the decline in price from ~$100-plus per barrel in 2013 to ~$30 per barrel now and the terms of the agreement. And, should crude prices remain at current levels, Rosneft likely cannot generate the cash to cover its investment, interest, and debt repayment obligations. 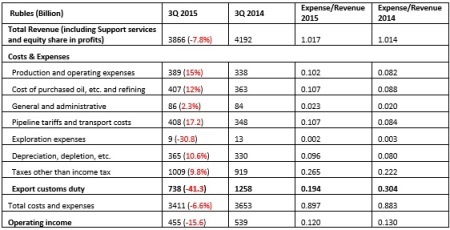 Given that average crude prices in Q4 2015 were substantially lower than in Q3 and that they likely will even lower in Q1 2016, Rosneft's financial operating results should also deteriorate substantially in these quarters. 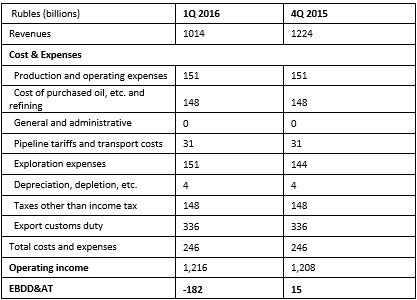 The following table projects Rosneft's revenues in Rubles in Q4 2015 and Q1 2016 using the Ruble's Q4 average US$ exchange rate and a guesstimate of the Ruble's Q1 US$ average exchange rate; an estimate of sales in volume terms, assuming output in 4Q 2015 continued to outpace 2014 levels by 2 percent and stayed constant in Q1 2016; and guesstimates of crude prices, taking into account Ural crude's discount to Brent, Rosneft's price competition in Europe with Saudi Arabia, and the impact on Rosneft prices in Europe and Asia from a prepayment agreement with Transneft that lowered its realized price per barrel (in Q1, Q2, and Q3, a reduction of RUB 200, RUB 40, and RUB 180 in Europe and RUB 170, RUB 350, and RUB 190 Rubles in Asia). Also, for the Saudis, the plans to sell shares in Saudi Aramco and/or its downstream operations could play an important role. The price investors will be willing to pay for shares in these entities will depend on the value they place on the entities, and this value will depend on their assessment of the entities' management, strategy, and prospects. If, for example, potential investors believe that management, at the behest of the Saudi government, will sacrifice growth, profits, and dividends to achieve Saudi foreign policy goals through low prices, investors' interest might be tepid at best. Their sovereign wealth funds and foreign currency reserves in absolute and per capita terms exceed Russia's, the value of their government owned energy assets are greater than the value of the Russian government's energy assets (which are already partially privatized), and Saudi Arabia and its Gulf Arab allies have access to international capital markets, whereas the Russian government, because of U.S. and EU sanctions, does not.